In awe of George Miller’s recent “Mad Max: Fury Road” – and the precision of craftsmanship that went into its ambitious chase sequences – I found it essential to return to the first source of that inspiration, a small and inexpensive movie that began life as a shell for one director to pour his distinct vision into. The first endeavor about the wandering avenger Max – then an agent of justice who had yet to endure his inevitable personal tragedies – was a broad and coarse character study without the refined world that we recognize as post-apocalyptic (though it did, in fact, open after the end of a devastating war). What separated it from a host of other law-enforcer-turned-punisher vehicles of that time, however, came down to a principal of technical values; it was not one of those pictures that blurred the coherence of a story in the jumbled images of nonsensical action, but one that celebrated the danger of the open road in photography with impeccable clarity. The majority of the picture seems to exist as an open protest of the time’s shoddy trend, and there is not a moment where we suspect the man handling the cameras isn’t willing to be right there in the middle of the chaos along with his subjects, potentially in the hands of incredible danger. In those first images are the seeds that would go on to become the elaborate shows of the later films of this series, arguably brought to a furor of artistic perfection in the most recent. The technical parallels between the first “Max Max” and “Fury Road” are the most obvious. Consider the opening sequence of the earlier film, in which an escaped convict known as the “Nightrider” is pursued on an open highway in the outback by a bumbling assemblage of legal authorities. In between focused cuts of the outlaw muttering fatalist diatribes in celebration of his escape, the camera follows the vehicles – sometimes from the front, other times from the back – without any notions of gravity. There are few bumps, shocking amounts of speed, and frequent sharp corners. How does any film cinematographer – even one as seasoned as David Eggby – go about accomplishing such visceral precision in the context of such extreme speed? Furthermore, how was it at all possible on the set of a movie where a budget was too tight to allow for post-production clean-up? Among many sensations we take with us into one of Max’s fatalistic journeys, few are as potent as the acknowledgment that the visual choreography is worth its weight in investigative wonder. Few now remember “Mad Max” from its origins, and perhaps that comes down to the principles Miller used to fuel his series over the course of four decades. Most directors are adept in the context of a singular film achievement; others more ambitious will take on projects with multiple chapters, usually made back-to-back without interruption in order to progress the moment’s vision. But here is a series that began life as a solitary blip on the radar, shot quickly and cheaply in order to herald the arrival of a group of exciting new faces from down under on the Hollywood scene. For all purposes, it was a movie made without regard to the concept of high art. But pieces of the fabric were stimulating enough to their creator that he chose to revisit this world in gradual increments, usually after progressing further into his artistic sensibilities. Understanding that context, the “Mad Max” films play like remakes of each other, a series of experiments meant to progress with each new entry, as if a continuous live show in which the camera witnesses the evolution of a theme. That conceit violates one of the primary rules of sequels, which is that less than 5 percent of them are ever as good as the original. Here is that rare franchise where each new release arrives with such resounding success that we tend to forget how it all began, or if we even dare wonder how it is possible to climb so many creative peaks in the sweep of time. None of that detracts from the acknowledgment of earlier films offering critical insights. The first “Mad Max” is the most dissimilar with that concept because it was made with a much broader mindset. The movie opens at the dawn of a world run amok (“the not too distant future,” a title card indicates), when society is in the throes of anarchy following a world war that devastated the class order system. The barren desert is dotted by small ghostly towns, with long stretches of road joining them seem to exist as conduits for the maniacal behaviors of radicals. The only source of order is the MPF Pursuit, a band of law-abiding highwaymen who patrol those corridors to prevent undesirables from infiltrating those small towns and causing chaos. Many of those enforcers – wisecrackers and adrenaline junkies – are chasing an escaped convict known as the “Nightrider” in the opening scenes when the most prized of their agents – known as “The Interceptor” – is sent in to stop him after a series of failed ambushes. Their brief confrontation ends in a fatal crash, but jumpstarts the vengeful enthusiasm of his gang of motorcycle renegades; when they arrive in a nearby town seeking the culprits to their leader’s demise, it culminates in a road-bound showdown between law enforcement and the criminally insane, usually with very ambitious results. The identity of the “Interceptor” is Max Rockatansky, a quiet and brooding sort whose primary motivations (at least initially) come from a place of general goodness. A husband to a lovely wife and young child, his skill on the open road nonetheless makes him a very hot commodity at the MPF headquarters, and when their demand of him culminates in a moment where he intends to resign, they silently bribe his continued allegiance by offering him a faster car. 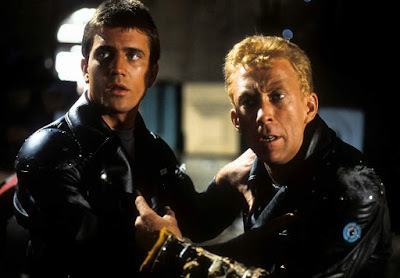 There are also loyalties permeating between him and his fellow motorists (including a hot-headed partner played by Steve Bisley), but one gathers that their bonds are made so simply by base realities. In a world where history is made in the hands of gangs or equalizers, sometimes being on the same side is enough of a commonality to create lasting friendships. The arrival of a sizable entourage of motorcyclists, led by an unruly and maniacal sort nicknamed “Toecutter” (Hugh Keays-Byrne), offers added challenge to their endeavors. In a nearby town, they bully and belittle the civilians, and chase a pair of young lovers out onto the road, where they trash their car and beat them up. Goose (the Bisley character) apprehends one of the gang’s looniest young faces, but when charges do not stick and he is allowed to walk free, it puts a crosshair onto his back that manifests into a very elaborate (and cruel) ambush where he is torched by the Toecutter in an overturned rig. By going the route of vengeful impulses with all those that surround Max’s volatile professional life, both Miller and his co-writer James McCausland are setting a stage of inevitable tragedies that must shape him – a ruthless but docile man – into an object of havoc that can be driven to the brink by great personal suffering. And when the movie climaxes by subjecting his loved ones to the obligatory bystander sacrifice rule of revenge movies, they are not so much setting up a final act filled with retribution as they are corroding the Max persona for the sake of continued evolution. If we remove the hindsight of follow-ups, the final scene – a moment that shows the title character frown vengefully as he speeds down an empty road – plays like the most obvious of narrative prophecies: it is a face we will surely be seeing more of. Later installments eroded the setting of Max’s world into one of civilization on the fringe of barbarianism, but it turned out to be an apt contrast to the core of the character, which was molded by his purity of conviction in a collapsing society before being relegated to the savage wastelands. The failure of many modern post-apocalyptic fables is that their leads are often given tragic histories for the sake of pigeonholing them into specific roles; we seldom believe in them because we lack the insight of their personas from earlier times. By starting his narrative prior to the point of no return here, Miller in essence created the most faceted of archetypical figures in modern science fiction, a character that was allowed to experience all of the critical intervals of social disintegration in front of a camera rather than one whose past was reduced to peripheral flashbacks. And the mannered performance provided by a young Mel Gibson – also an unknown at the time – is key in anchoring that mindset; just as his screen identity is gradually unravelling from the cold nature of the world, so is its fresh actor building a sense of himself in a story that paces its progression rather than rushing through it. Yet the movie itself as a whole has obvious shortcomings. While the overwhelming sense of style is modulated with the skill of an expert, the story’s focus is often meandering and unfocused. Characters drift in and out of the picture like stand-ins vying for screen time. There are scenes throughout the film that don’t seem like they fit; others still permeate the aura of filler sensibilities, perhaps only included to lengthen the running time. The climax – a long series of scenes that begin with a pursuit and end with a final blow of justice – is so long that it loses our patience halfway through. And even after all of that Miller is not quite aware of how to frame a good parting shot, instead leaving us with a feeling that Max’s next destination could be any number of stops that involve streetwalkers or drive-thru windows. Is any of this a surprise, even for those who will come to the film already having experienced the immeasurable values of the most recent installment? Not at all. Miller himself, a man who has spent his career always looking ahead, would likely agree with that prospect. The purpose of “Mad Max” was never about creating an object of visceral perfection, nor was it conceived in the minds of thinkers who were in full command of their artistic functions. It is a rough outline more than a full embodiment of its underlying possibility. But as a relic in the volatile genre of apocalyptic fables, it is at least a solid and entertaining spectacle, filled with brilliantly staged action scenes and made all the more fascinating for its oracular indication of the age of bold movie science fiction that was to follow.